Check this out! LED strips, super thin, flexable, and with the ability to change colors from a super thin Infra Red remote control unit. 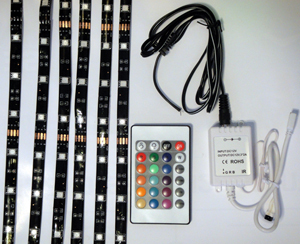 Kits come with 6 various length LED strips and all the hardware for a typical installation. Extra pieces and accessories to customize and use on 110 volt applications are also available.